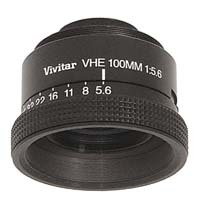 High quality Vivitar VHE 100mm enlarger lens, a recommended focal length for 6x7 and 6x9cm negatives. These lenses have a f/5.6 maximum aperture, knurled rubber aperture ring, click stops on each half stop, and a click stop override feature. Supplied with front and rear lens caps. Made in Germany for Vivitar by Schneider. These lenses are used and will have minor cosmetic marks on the barrel from previous use, but all used lenses sold by KHB Photografix are carefully inspected and are in perfect working condition. We provide a 6-month warranty. Note: These lenses are not supplied with a retaining ring. If a 50mm retaining ring is required for your application, it may be added for an additional $10.00 on request.